In 2005 Godfried Toussaint, a computer scientist at McGill University, published the paper The Euclidean Algorithm Generates Traditional Musical Rhythms. This showed how using the greatest common divisor of two numbers the Euclidean Algorithm can create the pattern of equidistant beats and silences found in all sub-Saharan African music in particular and world music in general. (The exception is Indian where beats and silences are asymmetrical). At a time when changes to the algorithms that control Facebook newsfeeds is making the headlines, that linkage of algorithm and rhythms in the title of Godfried Toussaint's paper is significant. Many great musicians from Sufi visionary Hazrat Inayat Khan (1882-1927) to avant-garde pioneer Jonathan Harvey (1939-2012) have recognised the seminal role of vibrating energy - frequencies and rhythms - in music, and, indeed, in much else. In a sleeve essay for Randy Weston's 1992 recording of sub-Saharan Gnawa musicians in Marrakech*, the authority on their music Rhashidah Elaine McNeill wrote: "The Gnawa musicians are master musicians who believe that everyone has a colour and a note to which she or he vibrates. Each individual responds to his or her chosen colour and note as the healer musicians play the hag-hopuge (guinbre - a three stringed bass)". The natural world is rich in vibrating energy and its associated resonances, which are found in everything from the sacred mantra Om, through a Stradivarius violin, to the spallation neutron source (SNS) accelerators and string theory (stringology) of contemporary nuclear physics. Facebook's newsfeed algorithms attempt to replicate these natural rhythms and resonances - 'you read and liked this story, so as it resonated with you we are putting other similar stories top of your news feed' - as do the algorithms of Spotify, Pandora, Google, Apple and all the other online gatekeepers that literally control our lives. Spotify is a particularly important case study: each Monday morning instead of popping into their neighbourhood record store to check out the new albums, more than 75 million Spotify users have online access to a new mixtape created by selective algorithms. The danger of replacing serendipitous personal discovery by sanitised comfort zones created using questionable machine intelligence - 'you liked this track, so as it resonated with you similar tracks are in your new playlist' - do not need to be reprised here. But one point can be usefully made. It is that our love affair with algorithms is fatally flawed. This is because because Facebook and others are devoting vast resources not to replicating natural rhythms and resonances, but to creating self-serving algorithm-driven cash cows. But more importantly, these algorithms are fatally flawed because binary processes can never replicate the infinitely rich rhythms and resonances of the analogue natural word, just as a the most powerful supercomputer cannot write a symphony . What are musicians but God's instruments? Perhaps this recording will remind us all that we have to get back to listening to the voice of God, that we may quiet the voice of man". 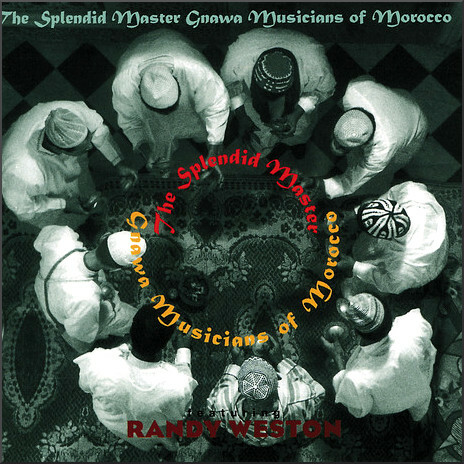 * The Splendid Master Musicians of Morocco with Randy Weston was recorded in the basement of La Mamounia Hotel, Marrakech in 1992 directly onto 2-track digital tape using two dummy heads fitted with Blanchet microphones created by filmmaker Vincent Blanchet for location recording. My CD copy reproduces an impressive sense of space and depth, but is marred by congestion in high level vocal passages. This congestion may be an artefact of the unconventional microphone array, or the unusual recording venue, or careless CD mastering, or most probably a combination of all three. Despite this the recording is well worth seeking out for its spontaneity. In an ironic sign of the times the CD is long-deleted and hard to find, but you can listen to it on Spotify and YouTube. And those who think that this and other posts linking modern technology to perennial wisdom are contrived should note that the word 'algorithm' is a conflation of the pioneering Persian mathematician and scholar Muhammad ibn Musa al-Khwarizmi and the Greek word for number arithmos. It is also worth noting that Godfried Toussaint is now Professor and Head of Computer Science at New York University Abu Dhabi.